The sculpture shores shored (Working Title) makes reference to the human form. The two sides of the sculpture are distinctively different, with the rear showing an anamorphic-corrugated structure, the front suggesting the human form, making perhaps an unconscious reference to Giacometti or Barnett Newman. But whereas their work suggests immanence, Michael Dean refuses any notion of transcendence, remaining rooted in presentness. Through the inherent sense of interaction and participation with the sculptures, the spectator becomes another object when walking around the artist’s installations. 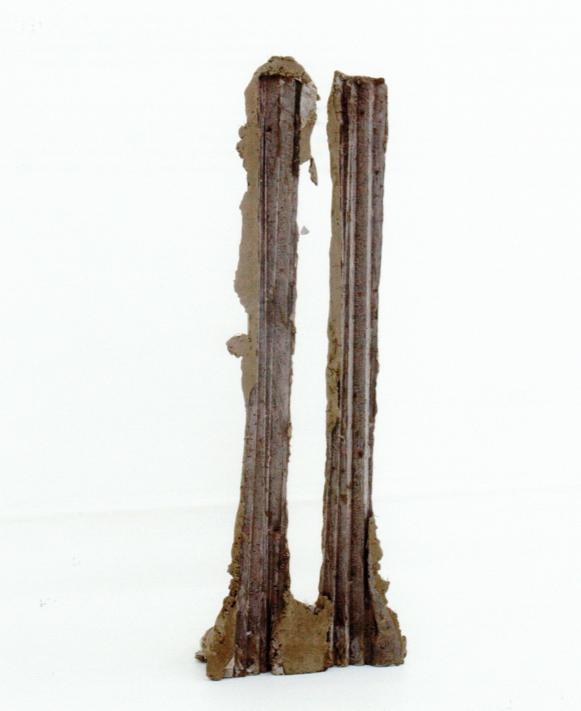 shores shored (Working Title) is part of a series of sculptures Dean began with an invented typography. Using the letters as the structure of the work — the transformation of words to material — the viewer is nonetheless unable to decipher the hence constructed words in the series. The basis of this series is the words shore and shoring. The seashore was important to Dean growing up in Newcastle as it was a place of rêverie (suggesting escape) and also a barrier. The shore is a liminal space, just as these sculptures hover between abstract construction, letters, human form and landscape.